Are Magnets A Useful Tool For Equine Holistic Health? The use of magnets for medicinal purposes is an ancient practice. As with any holistic health claim that has found a niche in human medicine, it was only a matter of time before it crossed over into the treatment of the animal world, and magnetism as a treatment for poor circulation, relaxation, and as a help against muscle soreness has finally made it to the equestrian set. Of course, the question that needs to be answered now deals with the effectiveness of magnetism as a tool for well being and healing. As such, some alternative therapists do believe that magnets – if used properly – will have a positive effect on the animals. Obviously, they are not miracle workers nor are they a panacea for whatever ails the animal, yet in addition to traditional veterinary intervention where needed, and proper input from a farrier if the hooves are affected, these magnets may actually do a bit of good. Generally speaking there are two kinds of magnets which are used, static magnets - which are available in a pad that may be applied for muscle soreness – and also pulse magnets that are more powerful since they are battery operated gadgets that may be found inside a blanket or leg wrap, and are supposed to be used for deep muscle relaxation. It is only natural that there are some skeptics eyeing these contraptions with something akin to contempt. While proponents suggest the use of the specially formulated blankets for a string of 20 minute treatments, and while they also strongly recommend that someone with extensive knowledge in the equine application of pulse magnets needs to be consulted, those opposed to this supposedly newfangled alternative healing tool claim that there is neither proof for effectiveness in treating anything, nor scientific evidence that magnets do anything at all that is related to health. For those with an avid interest in the field of equine magnetic health treatments, the idea behind the sessions is clear: magnetic fields which translate into electric signals that are sent to the cells can affect the cell’s correspondence with ions and thus affect the cell’s functioning altogether. Gently manipulating biological responsiveness accelerates the healing process and may even initiate it. Yet the effectiveness may be questioned in light of the horse’s physiology itself. Horses are not flat, but instead quite rotund, yet the magnets that are routinely marketed to the equestrian set are not even able to work through a couple of business cards, thus lending credence to the claim that they most likely are not even able to reach deep into the subcutaneous tissues of the animals. Yet for every opponent for the use of magnets in horses there is also a horse owner with a success story that she or he links back directly to the successful use of a magnet on an animal’s lame limb or injured neck. 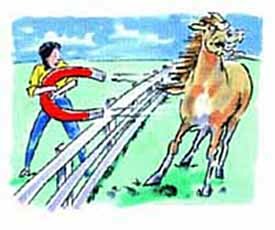 Once again opponents counter the arguments by stating that the time permitted for the magnetic therapy is quite often the time it takes a horse’s body to heal itself and thus the healing of the animal and the use of magnets are coincidental, and do not point to a cause and effect relationship. Yet there is one kind of magnetism that may show promise, yet it is not achieve with the magnets for sale in the equestrian catalogs. Instead, it involves the treatment of poor blood circulation with pulsating electromagnets fields, yet since this involves the introduction of electrical currents into the animal, the treatment is far too complex to be done by simply attaching a magnetic blanket to an affected area for 20 minutes a day. Add to this the fact that electromagnetic stimulations requires different kinds of magnets for different kinds of cells in order to show any effectiveness, it becomes clear quickly that a simple one size fits all mentality will not prove to be effective. While the battle lines are drawn in the argument of the effectiveness of magnets in the treatment of equine ailments, human studies provide little input since the placebo effect appears to be strong in those often not very scientific studies. At this point, veterinarians are eyeing the magnets with curiosity, but do not believe that there is much that has been scientifically proven thus far, usually for lack of a reliable sample, and the few success stories may or may not be true. Add to this the shady outfits that are seeking to profit from the perceived gullibility of those who might not have the knowledge to separate the “to good to be true ads” from those that make realistic claims, and it is not surprising that at this point in time the “nays” outweigh the “yeas” - until scientific studies are funded and undertaken proving once and for all what effectiveness, if any, there truly is. Read the next horse health tips article on Horse immune system.